I love the change of seasons! The last few mornings have been cool, and I can definitely smell a scent of autumn in the air. I would like to find the meteorologist who predicted more hurricanes this year, and place a gold star on his forehead because he has flat nailed it this year. Actually, I would like to stick the gold star on him somewhere where the sun doesn’t shine if he had anything to do with his predictions coming true. My heart breaks for Texas, Florida, Puerto Rico, and other places far and wide. Hurricane Irma struck us a glancing blow, but we were able to get by with minimal losses. 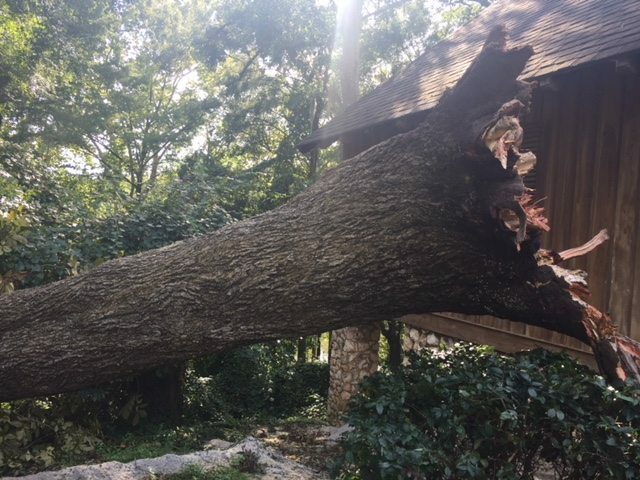 The only great loss was a huge hickory tree that fell away from my home. When it hit the ground, both Martha and I were certain that the back of our house was gone. We finally got up the nerve to go look, and it had fallen in the perfect position to miss the house, our propane tank, and even Martha’s precious ferns. And now when this hurricane business should be winding down, we have another one drawing a beeline for us. What is even worse is that they are naming this one after one of my precious grandsons, Nate. We were blessed last time, and I plan to follow the same plan as before, PLAN and PRAY. This is a fast mover as it should be in here Sunday and out of here Monday evening. We are expecting 2-4 inches of rain, but we could really do without 60 mph winds as we have just finished mowing, pruning, raking, and generally manicuring the lodge grounds. We did decide to hold off on laying pine straw around all of our flower beds this week as the straw could be in the next county by Tuesday. Oh well, if we have to, we do have time to re-polish the apple before our first guests arrive in less than two weeks. Speaking of guests and trips, I just got back from a couple of days of fishing for Red Fish in Louisiana with some old fraternity brothers. I couldn’t help but notice that some of us had gotten balder while others had gotten fatter. The most distressing fact was how our memories differed as to which ones of us were the biggest idiots during our college years. I quickly reached the conclusion that my buddies were beginning to slip a cog or two upstairs as there is just no way I did THAT. I distinctly remember it another way. But, we had loads of fun, caught a lot of fish, and made some more great memories. I would encourage you to think about calling Riverview for a hunt this fall or winter and make some memories of your own. At the end of the day and our time on earth, I would expect the memories of time spent in the fields and streams will far outweigh that day you spent in the office. Oh, by the way, we still stand at attention with our hands over our hearts when the national anthem is played here. Some of my friends never got the chance to be husbands, fathers, and grandfathers because they died for that flag! God bless America, and may God bless each of you and your families.